Nancy has no fear of taking a case to trial. The truth is, she enjoys going to court; it’s where she’s most at home. Still, Nancy recognizes that going to trial isn’t always in the best interest of her clients, and her primary objective is to resolve conflicts expeditiously and economically. 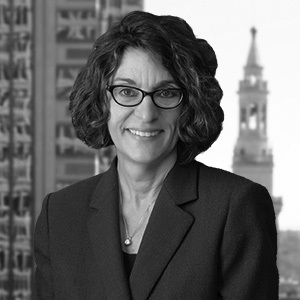 Nancy’s reputation as litigator reaches well beyond Springfield, as she has been recognized as one of the “Top 50 Women Attorneys” in Massachusetts and her practice area extends from the Berkshires to Boston in both state and federal courts. Whether that means going to trial, reaching a settlement, moving toward mediation, or alternative dispute resolution, Nancy’s focus is on analyzing the case and getting the best result for her client.